Overall US apparel sales went down by 2% in 2017, however ecommerce is seeing double digit growth. Selling online is your biggest opportunity for growth and Amazon is a major player. Our recent benchmark report, The Winning Elements of Amazon Fashion Pages, more than 89,000 product pages within the ‘Clothing, Shoes & Jewelry’ category live on Amazon. The findings can help you build a strategy that improves conversion and visibility for your product pages on Amazon and beyond. 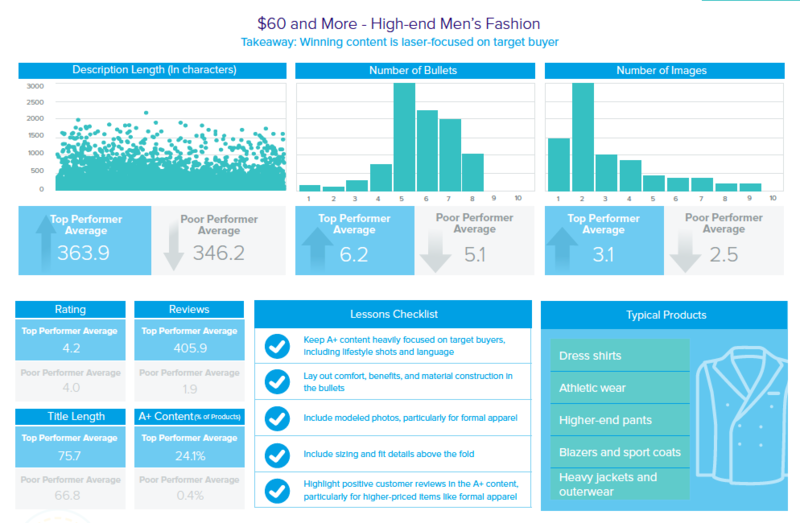 The high-end top performers use an average of 6 bullets to detail comfort, benefits, and material construction. Use marketing language throughout the description that shows your target audience you understand their needs. Including the words that consumers are searching for, like cotton, machine washable, everyday wear, athletic, etc., in your descriptions, bullet points and A-plus below-the-fold content can help your product get found. Use most important copy or terms found in user reviews in titles and in primary descriptions to differentiate your product immediately. High-end top performers use an average of 3 images per product, but the real strength is the variety of image types. Use images to showcase the product’s look in multiple poses and environments, include images for all color variations of the product, and call out benefits or features of the product in text over an image. A sizing or measurement chart or washing guides for delicate materials serves as an easy reference and gives shoppers confidence before they buy. Use reviews and common questions on your page to determine what additional reference material could be helpful for discerning buyers. Thirty-six percent of high-end top performers use A+ Content. Consider outlining your brand or product story below the fold and highlighting positive customer reviews, with photos. Ultimately, your Amazon product detail page is the chance to represent the full story of every fashion item you sell. Buyers want to understand the fabric, fit, quality and style at a glance. By understanding the tactics used by top-performing pages at every price point, you can adjust your own strategy and stand out across the digital shelf.